July 11, 2009 2am had severe pain in chest and could hardly breathe... so went to neighbour for prayer but the symptoms persisted so was forced to call 999. Up to that time had not been to doctors or taken any medicine for about 21 years. 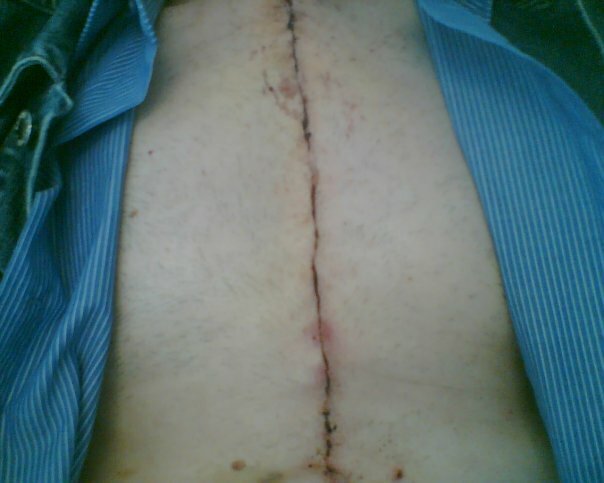 August 3 Had triple heart bypass (CABG x 3). Sept. 21 Had 2nd operation to remove growth from my bladder (TURBT). Am presently out of hospital But I need prayer to recover/heal. 1. Saw all immediate family - some members of which I hadn’t seen for some time! 2. My heart surgeon Prof Bonser was mentored by Christiaan Barnard who did the first heart transplant in Dec.3, 1967. Bonser is considered one of the best surgeons for heart ops in the world. Also I was told that the urology department ( where I had my bladder surgery done) has an excellent reputation for surgery and care. 3. Had a long term Christian friend working in intensive care while I was in hospital. Also met again other Christian friends who I had previously met working in the hospital wards where I resided for periods of time. These Christians were a great blessing to me and gave me favour. 4. Presently walking longer distances every week and generally on the mend from operations. Many people in hospital around me died, for example in intensive care shortly after I left 4 people died within a 24 hr period. Also when I was transferred to a recovery ward after intensive care a man died 5 weeks after being released from hospital. 5. When I was in hospital they found a growth in my bladder in the nick of time. Last but not least I thank the LORD for bringing me “out of an horrible pit” and also for the people who prayed for me, gave me practical help and paid me a visit whilst I was hospital and at home.